When one watches a TV series from the beginning, one usually becomes emotionally invested in the characters. Whether it is Jack Bauer from 24, Homer Simpson from The Simpsons, the inbetweeners from The Inbetweeners, or the leading police officers from 21 Jump Street, viewers usually acquire affection (or disdain) for the characters, and normally they carry their sentiments on into the film adaptation(s) or spin-off(s). But what if one has not watched the TV series that a film is based on? Can one still enjoy the film to the same extent as if one had watched the show? Spooks: The Greater Good may give us an answer. Harry (Peter Firth) convincing Will Holloway (Kit Harington), an ex-agent, to trust him and to rejoin M:I-5. Spooks is based on the British TV series with the same title that aired between 2002-11 (although it was also called M:I-5 in some circles). 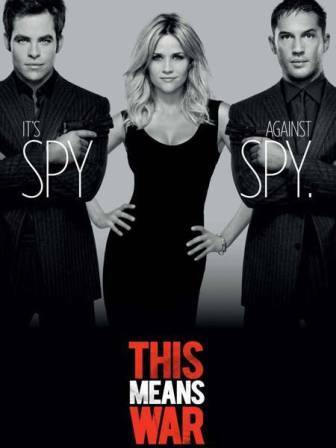 The film is a spy thriller. At the start of the movie, Adam Qasim (Elyes Gabel), a terrorist wanted by US authorities, is in the hands of M:I-5. He is on his way to being handed over to the CIA in London when the vehicles driving him are attacked in a heist. Threatened with the deaths of agents in the streets, M:I-5 orders the agents to hand over Qasim to the armed attackers. Now free, Qasim plans a terrorist attack on London. While M:I-5 looks for him and determines what he intends to do, Harry Pearce (Peter Firth) disappears. 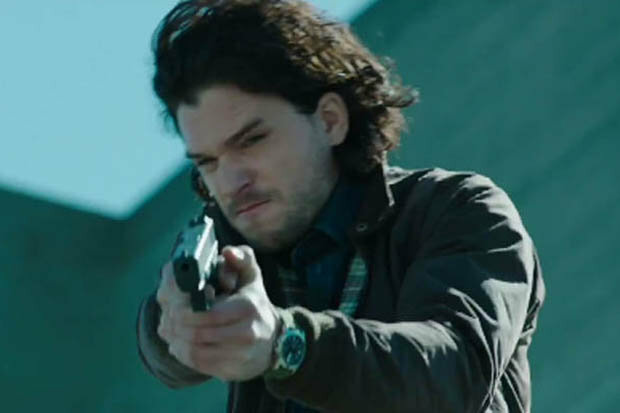 He is convinced that there is a traitor in M:I-5 who let Qasim free, and he re-recruits Will Holloway (Kit Harrington), an ex-agent, to help him find out who the traitor is. Spooks is a solid espionage thriller. The film is quite grounded and beguiling with good acting and humorous dialogue. For one who has not watched an episode of Spooks the TV series, there are probably some subtleties that go unseen. But not seeing these does not make the film any less entertaining. Furthermore, the film is written in such a way that the allegiances (and rivalries) between key personnel in the upper echelons of M:I-5 are spelled out quite early on in the film. So, one should not have a problem understanding who is on whose side… until they switch sides, of course. But that happened in the TV series regularly, like in 24, and is also part and parcel of the spy genre in general. How much emotional investment in Spooks one needs prior to watching the film is debatable. June (Tuppence Middleton), an M:I-5 agent, going in with a fellow agent to take out some terrorists. Yes, it may have helped to know what the shifty Harry Pearce, played well by Peter Firth, is like before going into the film in the same way it may have helped to watch The Simpsons on TV to appreciate what makes the blundering Homer Simpson so endearing before watching The Simpsons Movie. Similarly, watching Spooks the TV show may have helped to get to know supporting cast members played by Tim McInnerney and Lara Pulver. Both reprise their roles from the show well but are given little screen time during the movie (especially compared to Peter Firth’s character). Nevertheless, for every actor reprising their character, there are a handful of new characters. Jennifer Ehle, Tuppence Middleton, Eleanor Masuura and, chiefly, Kit Harington were never part of the TV series. Suffice to say, all of them have a role in the film and add something different to the plot. Fans (and non-fans) of the show cannot have known these characters or anticipate their motives prior to the movie. This means that the film is going to deviate from the show and that whatever happened previously in the TV series is unlikely to be crucial. Jon Snow… I mean, Will Holloway being the hero and using a gun, instead of a sword, to take out a foe. Yet, if fans (and non-fans) are arguing over how alike Spooks the film is to Spooks the TV series, they are arguing over the wrong issue. How closely the film resembles the show pales in comparison to the problem of the film’s tone. Director Bharat Nalluri cannot make up his mind if he wants the film to be taken seriously, like Tinker Tailor Soldier Spy, or as a spoof, like Kingsman: The Secret Service. Bearing in mind the title of the movie reads and sounds close to ‘spoof,’ it may have been logical to make the film as a satire, as James Bond was pre-Daniel Craig. (Or maybe that conclusion is borne from not watching the TV series?) Either way, Spooks’ tone is confusing. Add in the (numerous) implausible plot twists and it is understandable that viewers get into a fuddle as to what sort of a film they’re watching. Over-all, Spooks is an enjoyable spy thriller. It has been put together well enough to ensure that viewers who have not watched the TV series that preceded the movie are not worse off than those who did. The tone of the film may be puzzling and some of the Byzantine-like scheming makes no sense. However, Spooks: The Greater Good has got good acting, dialogue and intrigue, with semi-grounded action. Thus, like any film with such ingredients, Spooks is a decent movie and worth a watch. Titular characters are usually (and unsurprisingly) the main characters in their films. Bruce Wayne/Batman is the lead character in Batman Begins, Conan is the central performer in Conan the Barbarian, and Tony Stark/Iron Man is the dominant personality of the Iron Man franchise. Yet, in some movies the titular character is usurped by a member of the supporting cast. This is what happens in Captain America II: The Winter Soldier, and in this case it makes for a better spectacle. The saucy Natasha Romanoff/Black Widow (Scarlett Johansson) bent over a computer, uploading data as part of her mission. Captain America II is a significant improvement on Captain America I. Its storyline is much more enjoyable and it justifies its 136 minute running time. Unlike the lacklustre and simplistic plots of Captain America I, Iron Man III and Thor II (the latter-two films being the previous two instalments of Marvel’s ‘Phase II’), Captain America II’s storyline tries to be complex and raises some thought-provoking moral dilemmas. Issues, such as the use of drones, and how far government agencies are permitted to use technology to gather intelligence about its citizens (and foreign ones) are matters that are greatly relevant to the present era, and the film should be commended for bringing them up. However, Captain America II lacks the stamina to maintain these complicated themes as the film goes on. This is because the movie does not have the maturity of Tinker Tailor Soldier Spy, so it falls into laughable stereotypes and senselessness; all of which is a shame to a degree, yet do not affect the film’s entertainment value. 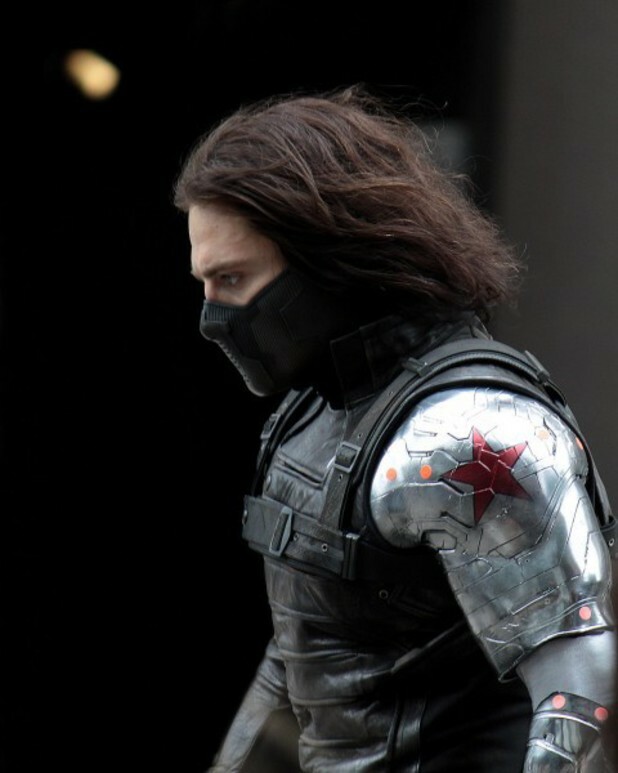 The part-masked and super-powerful Winter Soldier, whose identity and motives are unknown to SHIELD. Black Widow undoubtedly overshadows the titular Captain America. This is not surprising since Captain America is the least talented and the least interesting of all the Marvel heroes. Captain America is merely the archetypal soldier without a bad bone in his body, which (as lovely as it sounds) makes for dull viewing (which was probably why Captain America I was so boring and why the directors included Black Widow this time around). This is not to say that Chris Evans does a bad job with the material he’s been given; it’s just that the material doesn’t have enough substance to it and wastefully does not develop Captain America’s character. The same is true for Nick Fury (Samuel L Jackson), while the villains (none of whom I’ll name for fear of spoiling the film) are even less fleshed out and significantly more trite. Trite is also how one can describe the dialogue in Captain America II. For the heroes, the dialogue is lazily written; for the villains, it is pitifully comical. 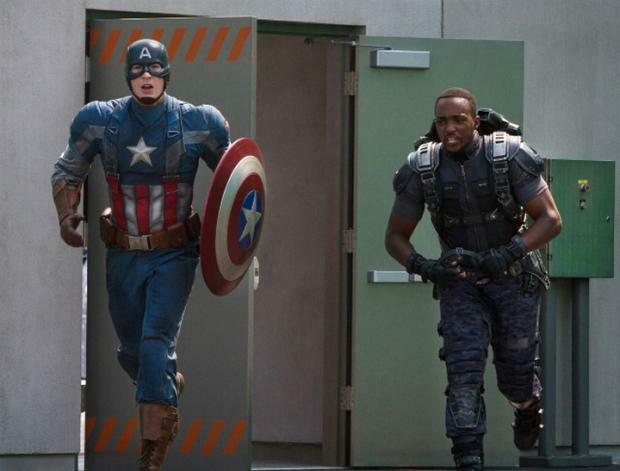 Steve Rogers/Captain America (Chris Evans), in full garb, ready to take out his (and America’s) enemies, alongside the Falcon (Anthony Mackie). But dialogue aside, the many (but thankfully not too many) stunts and action scenes are well choreographed. Those, in addition to the decent CGI and the uplifting music score, make Captain America II an enjoyable watch. 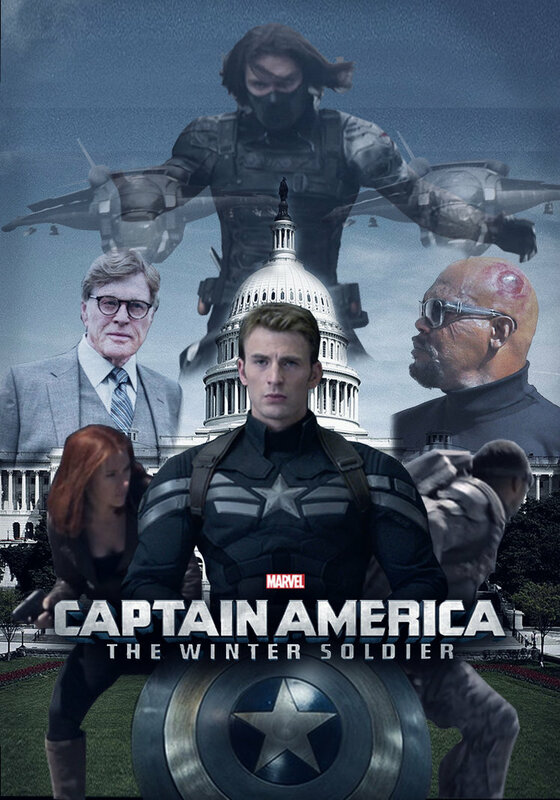 All-in-all, Captain America II: The Winter Soldier is an entertaining comic-book hero movie. Its attempts to be complicated, both on a plot and on a moral level, may become silly as the movie goes on. Yet, the film holds its audiences interest throughout its over two-hour running time. Unquestionably, this is because of Natasha Romanoff/Black Widow. In Captain America’s own movie, Black Widow steals his thunder (pardon the Thor pun), so much so that the film should not be called Captain America II: The Winter Soldier, but Black Widow: The Savvy Avenger. Last year’s Tinker Tailor Soldier Spy (TTSS) was a wonderful example of the capabilities of the British Film Institute (BFI). The acting, the dialogue and the settings were noteworthy, plus it gave audiences a true sense of the machinations of the British secret services. Similarly, in Shadow Dancer, the BFI has come up again with another quite impressive film about the murky world of intelligence and underground movements. Shadow Dancer is based in Belfast between 1993-94, at the time of the Anglo-Irish Treaty, and revolves round Collette (Andrea Riseborough). She is an Irish Republican Army (IRA) activist, who gets arrested for attempting to blow up Mile End underground station in London. Her interrogator from MI5, Mac (Clive Owen), gives her a stark choice: either face prison and the loss of her son, or become an informant. Mac believes she is a useful person since she has close ties to the most important people in the IRA’s ‘military wing,’ in particular with its leader, Gerry Adams (Aiden Gillen), and his henchman, Kevin Mulville (David Wilmot). Reluctantly, Collette agrees. Shadow Dancer is a slow-moving, tense thriller. In the same vein as TTSS and Harry Brown, the settings are gritty, non-theatrical and reflective of the era which help to set the tone of the film; in this case, some late-eighties hair-styles and the cream-coloured, box-like computers. Yet, unlike the two aforementioned films, Shadow Dancer runs out of steam, turning to an eclectic mix of predictability and vagueness that undermines much of what is good about the movie. 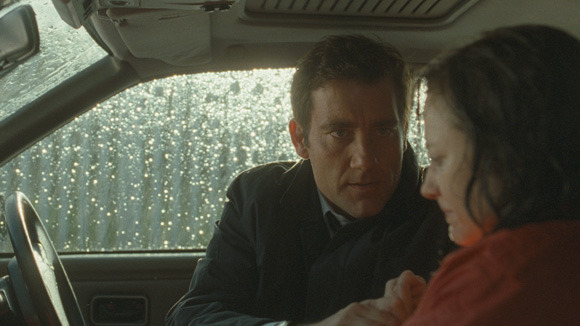 Collette meeting with her MI5 boss, called Mac (Clive Owen), to discuss the IRA’s latest plans. Aided by a well-written, realistic script and solid acting, Shadow Dancer illustrates the tough life of a militant activist and the dangers of being a double-timer for a movement like the IRA. 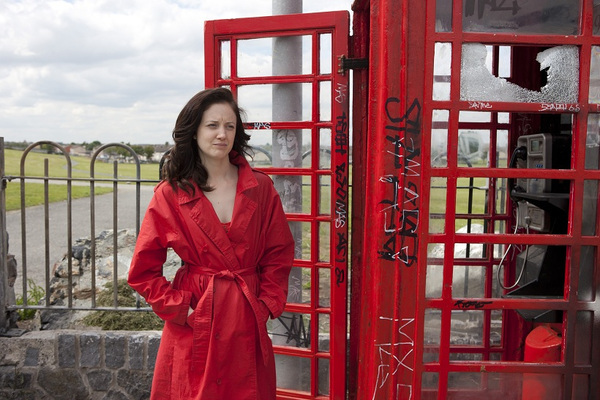 This is all exemplified astoundingly by Andrea Riseborough as the vulnerable Collette. Without doubt, Riseborough is the star of the film and enhances her growing reputation, after emerging as the only actor to come out unscathed from W.E., the atrocity directed by Madonna. Riseborough makes us empathise with Collette’s difficult and mentally-strenuous situation without appearing weak or cowardly. And her Northern Irish accent is flawless. All of this is no small achievement. Moreover, Collette’s situation allows audiences to gain an understanding of the IRA’s internal disagreements over the treaty, between the ‘military wing and the ‘political wing,’ the latter headed by Ian Gilmour (Stuart Graham). 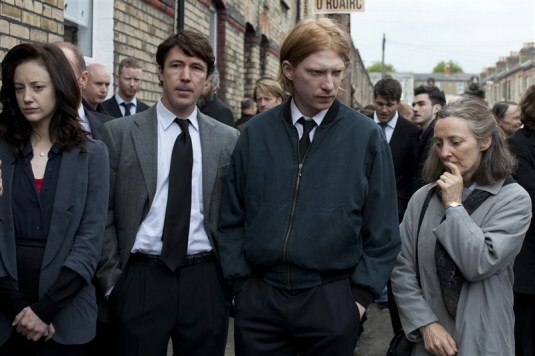 Collette looking on sadly at a funeral, standing alongside with Gerry Adams (Aiden Gillen), her brother Connor (Dohmnall Gleeson), and her mother (played by Brid Brennan). The red haired man in the background. Yet, surprisingly, Shadow Dancer does not do the same for the inner workings of the British secret services, vis-à-vis the IRA. Whereas TTSS was layered with intrigue, Shadow Dancer falls into a (depressing) cliché wherein Mac plays the ‘good operative,’ since he backs the main character, in contrast to Kate (played by a steely Gillian Anderson), his main (villain-like) adversary, who has an ulterior motive and isn’t given the time to justify herself. All-in-all, Shadow Dancer is another worthwhile movie made by the BFI. Like TTSS and Harry Brown, it has a grounded and harsh feel that is only lightened by the remarkable performance of Andrea Riseborough. It is just a pity for Riseborough that Shadow Dancer’s storyline lacks the complexity and plausibility that is so striking about her display. For years now, the horror genre seems to have lost its way. Few horror films, such as Audition, Martyrs and The Orphanage, have been genuinely scary. More often than not, horror movies have been poor excuses for comedy, such as Jennifer’s Body and The Wolfman. The Woman In Black continues this worrying trend for a genre that’s in a crisis. Arthur approaching the derelict Eel Marsh House. Who would want to go in there during the day, let alone stay overnight? 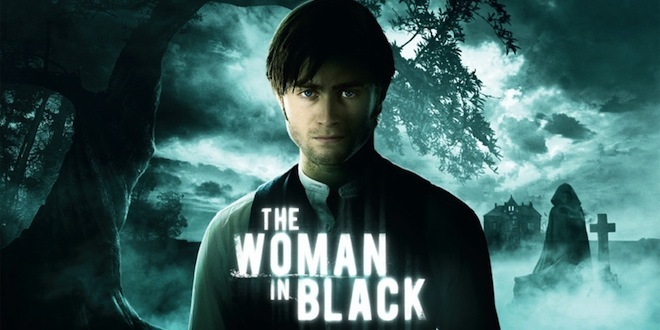 The Woman In Black is based on the book with the same title by Susan Hill, which has also been adapted to the theatre. The film is set at the turn of the twentieth-century. It is about Arthur Kipps (Daniel Radcliffe – Harry Potter I-VII(ii), Kill Your Darlings), a young lawyer and single parent, following the death of his wife, Stella (Sophie Stuckey – Driving Aphrodite, The Dark, Comedown). Arthur is on his final warning at the solicitor’s firm he works for. Consequently, when he is given the task of managing the estate of Alice Drablow, who owned Eel Marsh House, a mansion in the middle of nowhere in the gloomy north-east of England, he cannot say no. The estate is old and slowly rotting. No-one has lived there for years. Those who dwell in the nearest village, except for Daily (Ciarán Hinds – The Debt, Tinker Tailor Soldier Spy, John Carter), who befriends Arthur, urge Arthur to stay away from Eel Marsh House. 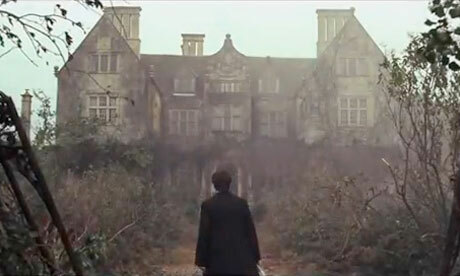 The villagers believe that the estate is haunted. The movie’s plot is as original as The Wolfman and Fright Night. Alike those laughable films, The Woman In Black has merely a few instances of the shock-factor. One would think that a creepy horror thriller would hold its audience in suspense, as The Shining and I Still Know What You Did Last Summer did so well. But, akin to Jennifer’s Body, The Woman In Black hardly makes the adrenaline pump. 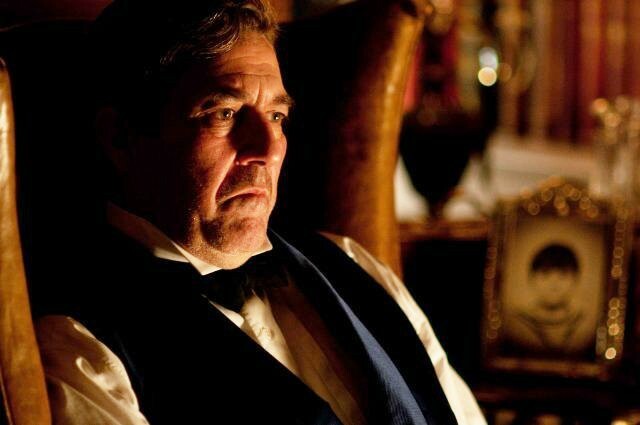 Daily (Ciarán Hinds), sitting in his armchair in his home, listening to Arthur tell him about how he has seen the woman in black over a glass of whiskey. The Woman In Black’s storyline is made to look even worse because it makes as much sense as John Carpenter’s (abominable) The Ward. By the end of the film, amongst many failings, one knows little more about the woman in black than when he/she started the movie. Viewers are aware that this dead woman has an eye for vengeance, but what drives her? Why does she appear every time a child dies in the local village? (Indeed, why would she limit herself to that small place when she can terrorise all of England or the world?) One cannot help but ask oneself why director James Watkins (Eden Lake) did not at least try to explain the woman in black’s motives. The plot’s poverty is reflected in the acting (even if the script gives them little chance to shine). Daniel Radcliffe hardly plays better here than he did in the Harry Potter series. He shows little emotion when trying to be affectionate towards his infant son, or when he is grieving for his deceased wife. This entails that viewers cannot feel anything for Arthur when he has to temporarily leave his son to go to Eel Marsh House. 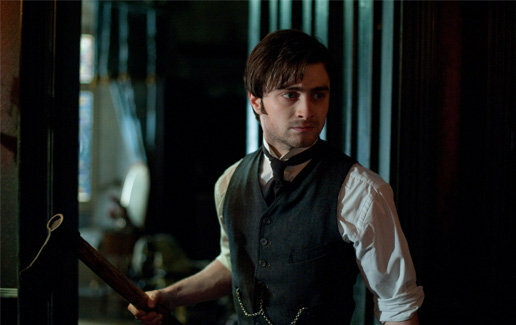 Radcliffe is also unable to shirk off his type-cast in The Woman In Black. As a result, whenever phantoms go near Arthur, one secretly believes that Harry – I mean Arthur – will simply pull out the Elder Wand and zap the dark ghosts into oblivion. This undermines Radcliffe’s attempt to be a professional solicitor in this movie. Similarly, the quality of the acting from the supporting cast fairs equally badly. The usually reliable Ciarán Hinds performs below his normal standards as Daily. Janet McTeer (Tumbleweeds, Island, Albert Nobbs), Daily’s wife, appears little in the film, and when she is given screen-time she plays a two-dimensional mentally unwell person. And the rest of the cast, the villagers, merely play one-dimensional unwelcoming, superstitious freaks, meaning that the audience cannot relate to them or take them seriously. Arthur holding an axe, scared, as he goes upstairs to investigate where the noise is coming from in the abandoned estate. Just like the acting, the make-up and special effects in The Woman In Black are neither poor nor noteworthy. The woman in black, herself, just looks like a gaunt and hideous doll behind a blurry veil, whilst the dead children look like they have life in them. Additionally, the costumes and the hairstyles don’t look plausibly like they’re from the early-1900s either, which gives viewers more reason to view this movie with contempt. Over-all, The Woman In Black is (yet) another pitiful horror film. It has few redeeming features, save for a couple of scary moments to justify the movie’s place in the genre. The Woman In Black is not as risible as other recent, aforementioned horror films. But the movie’s inadequacies are symptomatic of a genre that’s in dire need of a revamp. The term ‘born for greatness’ is one often used to describe the life of king. Nevertheless, it is a vague term: one that does not give a remote hint to the strains and struggles that comes with achieving great feats. The King’s Speech illustrates a form of such a challenge with the brilliance of a masterpiece. 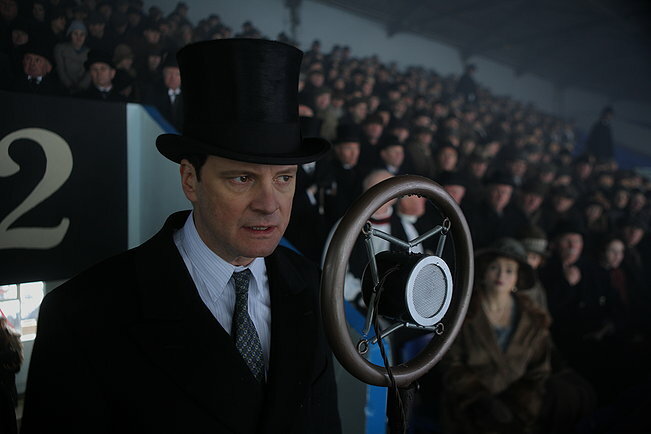 Bertie, played by Colin Firth, gives a speech at Wembley in the mid-1920s that goes awry due to his stammer. The film centres on Bertie (Colin Firth – Bridget Jones’ Diary, Dorian Gray, Tinker Tailor Soldier Spy), the future King George VI of Britain (1936-52), who has a terrible stammer, and how he must overcome this stammer in order to compete with the other great orators of his era, such as Sir Winston Churchill and Adolf Hitler. When it becomes clear that his older brother, David (Guy Pearce – Memento, The Hurt Locker, Prometheus), the future King Edward VIII (abdicated in 1936), would rather marry Wallis Simpson (Eve Best), a twice-divorced American woman, than take up the throne, the necessity for Bertie to speak more eloquently becomes paramount. After-all, he is next in line. After trying several therapists for years, Bertie turns to Lionel Logue (Geoffrey Rush – Pirates of the Caribbean I-IV, Shakespeare In Love) and his unconventional methods to help solve the problem. By taking us through stage-by-stage of Logue’s methods, the director, Tom Hooper (The Damned United, Les Misérables), ensures that we see Bertie’s tremendous struggle to complete a sentence without stuttering (something seemingly so effortless for the majority of us). However, we would not be able to realise just how frustrating and aggravating it must have been for Bertie if it weren’t for the exceptional performance of Colin Firth. Never before has an Adam’s Apple been so over-worked or scrutinised as in The King’s Speech. Yet, it is not just Bertie’s consistent stammering that makes Firth’s act so memorable, but also how it affects Bertie’s general behaviour. Throughout the movie, the future George VI suffers from chronic diffidence. His speech impediment affects everything from the way he walks, talks and looks at people; to his need for emotional support from his wife, Elizabeth (Helena Bonham Carter – Fight Club, Harry Potter V, VI, VII(i) & VII(ii), Alice in Wonderland, Les Misérables), the future Queen Elizabeth II’s mother. And this does not even include his bad temper or his fears; most notably, public speaking. In a first-class display, Firth captures Bertie’s dread superbly as well as his character’s comprehension of the responsibilities of a monarch. 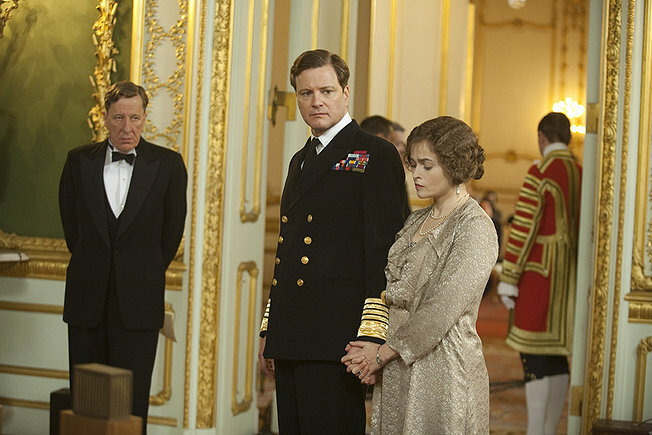 Anxiety reigns supreme as Lionel Logue (Geoffrey Rush), George VI and Elizabeth (Helena Bonham Carter) wait for the king to give his big speech not long after Britain declared war on Germany on 3rd September 1939. Firth is undoubtedly the stand-out performer of the movie. But that is not to say that Geoffrey Rush or Helena Bonham Carter do the film a disservice. On the contrary, they play their roles very well: the former as the tolerant therapist with a wry sense of humour, who understands how best to deal with the king’s stammer; and the latter, as the supportive wife of a man who feels that he must triumph against all odds in order to carry out his duty as king. Alas, The King’s Speech does not touch upon the gastric problem that Bertie endured throughout his life. It also wrongly portrays the relationship between Bertie and David. (Not to mention the one between Elizabeth and David too.) Since the film is based on real events (as opposed to a book or an urban legend), historical accuracy is important and is slightly lacking in the movie, even if it is regarding a relatively minor part of the story. This, though, should not take too much away from The King’s Speech. The film is simple, original and outstanding. In addition, it is funny (albeit in a very English way) and engaging. The acting is fitting for Oscar nominations, and Firth’s ability to make us feel the pain that Bertie’s stammer caused him is right up there with the greatest of performances. That there is no fairytale ending to the film gives The King’s Speech greater credit and more than a twinkle of realism: it makes us appreciate how and why King George VI managed to win over the affections of millions across the world.